Hi John! I just wanted to send you tons of love from Kauai! While here, I went high up into the mountains where there was a monastary and this beautiful statue, who represents a Hindu God of Wisdom. People that come here leave behind trinkets and coins asking for a blessing. I decided to leave behind my JBT bracelet too (can you see it on his thumb?) and I said a prayer that all the doctors and scientists who are working on a cure for DIPG will find the wisdom to end this cancer for good. I hope you think it’s cool that one of your bracelets is hanging out somewhere way up in the mountains of Kauai! It’s so beautiful here and I am thinking of you, your mom and your whole family every day. Love you – mom’s friend Maura. Banana & Nutella on a hot dog roll please. Hi John! On Thursday nights when your Dad skis with our Dad, we chill at home and have theme dinners. Last night was JBT Night! We got our JBT shirts on and ate one of what we think is your favorite treats, banana and Nutella on a hot dog roll. It was amazing! I just wanted to let you know that I proudly wore your t-shirt on my February vacation! I included a picture of me wearing it in Cozumel, Mexico in front of a purple VW Dune Buggy. I look forward to your art show in March and continue to keep sending lots of positive spirt.courage.hope your way! John, a few months back I was working on a job where I had to wear this crazy respirator! I was in a space where the air around me was not good for me to breathe. With this, the air I breathed would go through the two purple filters and then it was safe for me. Just another thing we do to keep ourselves healthy and feeling good! As you can see, it made me a little CRAZY!! All I wanted to do was hang out with you and the family! Hi everyone! We wanted to let you know we are all thinking of you and praying for good things. There are many familiar arms in the picture. 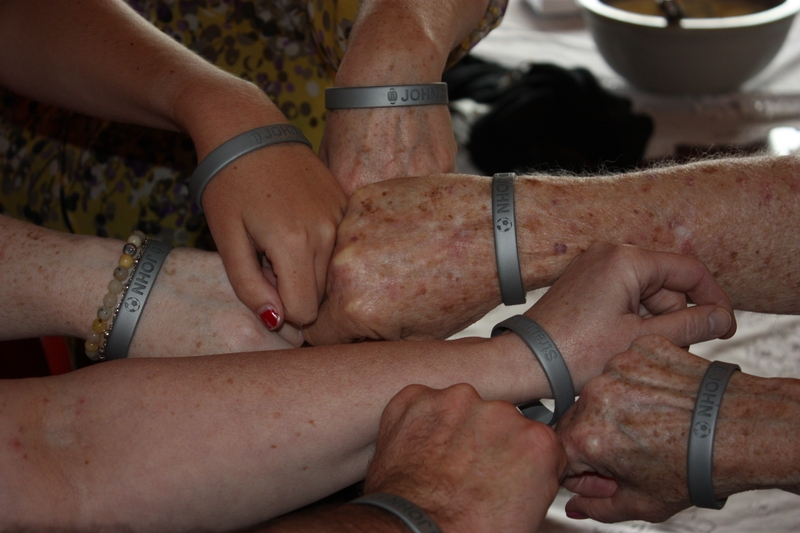 See if you can recognize Uncle Jimmy, Amy, Aunt Ann, Robert, Terry, Meghan and Kathleen. A Race Against the Odds. 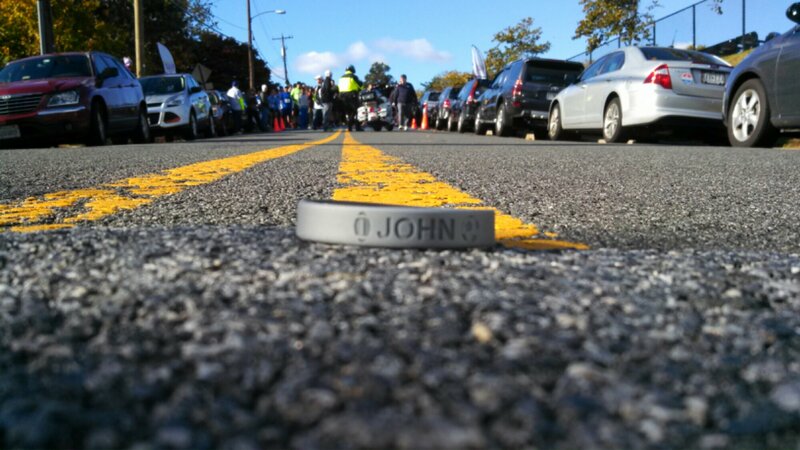 John was with us at the National Race Against the Odds in Washington DC today. Always thinking of him! Keith and Brooke Desserich & friends!